As part of the roundtable debate on secondary prevention of recurrent atherothrombotic events, Dr Paul Tunnah speaks with a participant, expert cardiologist Professor Evangelos Giannitsis, to hear his perspectives on secondary prevention. 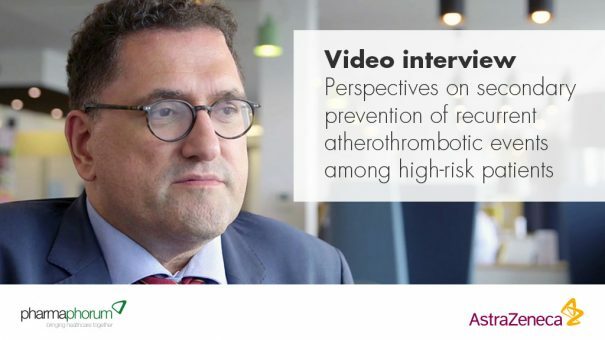 This media accompanies the roundtable video debate ‘Secondary prevention of recurrent atherothrombotic events among high-risk patients’, sponsored by AstraZeneca. In conjunction with the roundtable video debate, pharmaphorum are releasing individual video interviews with the four expert participants. Here, Professor Evangelos Giannitsis gives his views on high-risk patients and secondary prevention. 00:12 – How would you define high-risk patients in the context of recurrent atherothrombotic events? 00:45 – How is the patient journey different on a global level? 01:45 – How variable are the professional guidelines that are used across different regions? 02:17 – What are the major factors behind countries where the guidelines are adhered to more closely than others? 02:41 – What is the role for non-cardiologist specialists within addressing secondary prevention? 03:52 – How can we link up different specialists dealing with patient comorbidities to provide a more cohesive treatment pathway? 04:50 – Are we starting to see linkage between data in different disease areas in terms of treatments? 05:40 – In cardiovascular disease, including primary events, how big a problem is preventing secondary events? 06:54 – Is there one particular area where you would like to see greater focus for improving secondary prevention?